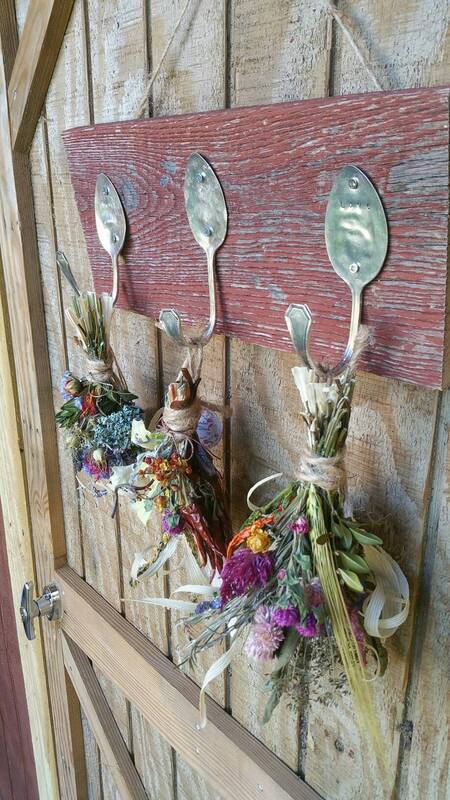 This listing is for one Rustic Farmhouse Triple spoon Handstamped red barn wood herbal drying rack with 3 dried herbal/floral bunches. These arrangements are Made to Order. Pictured is a sample of Rustic Farmhouse Autumn theme. Dried Muted Pastel flowers and botanicals in Autumn colors such as mauves, purples, blues, yellows, dried lavender and more in small bunches that can hang from the 3 spoon barn wood herbal drying rack. Creatively made with care for your home decor enjoyment and love of nature and its beauty. The Hand Stamped spoons say, "Faith, Hope and Love". Ready to hang in your humble abode. No two sets are exactly alike as I make them to order and with materials I have that is available. Rack Measures approx. 15 in long, 6 in tall and 1 inch deep. Dried Floral Bunches measure approx. 7-9 in tall and 3-5 inches wide. Makes a Unique and wonderfully amazing decor for your home placed in your kitchen, entryway or living room for a nice year 'round decoration.